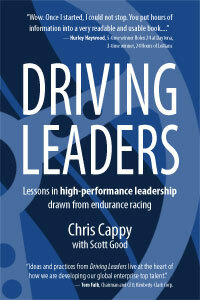 Driving Leaders: Lessons in high-performance leadership drawn from endurance racing. Is your team highly focused? Can you adapt to lead requisite business changes quickly and effectively? Are you executing your strategy smoothly with speed and precision? Are you well-positioned to get beyond current limits and to achieve new dimensions in performance? We have for years utilized racing circuit experiences in a variety of ways to address these questions. Whether it's one of our networking oriented “Pilot Porsche Parties” or a custom designed program with business objectives in mind, this learning environment is unparalleled offering lessons that last in terms of personal, leadership and business performance. There are significant parallels between high performance driving practices and leading at speed while under pressure… our “new normal.” The need for leaders to deliver results – consistently, better and faster – benefits from a disciplined approach to driving change. Typically delivered as a workshop, participants are engaged on the track to learn fundamental practices for high performance driving. Following this is class application time of proven, highly effective disciplines that accelerate outcomes in business. The work is fast-paced and focused around a specific and significant business challenge of a participant’s or team’s choosing. This is a fully engaging and extraordinary way to make forward progress on the most important business challenges you face. Driving Leaders Experience are designed to address these important questions, offering unparalleled leadership development that delivers lasting results in terms of personal, leadership and business performance... and more. There are strong parallels between high performance driving practices and leading at speed while under pressure… our “new normal.” The need for leaders to deliver results – consistently, better and faster – benefits from a disciplined approach to driving change. Delivered as a workshop, participants are engaged on the track to learn fundamental practices for high performance driving. Following this is class application time of proven, highly effective disciplines that accelerate outcomes in business. The work is fast-paced and focused around a specific and significant business challenge of a participant’s or team’s choosing. This is a fully engaging and extraordinary way to make forward progress on the most important business challenges you face.